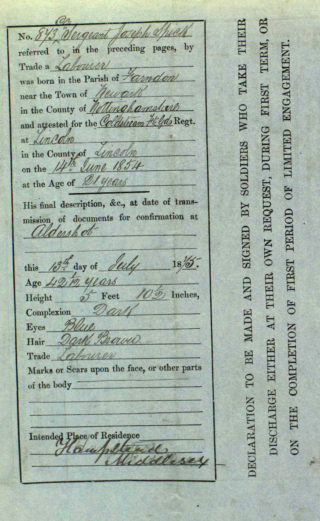 Summary record of Joseph Spick's army service: this image shows the upper part of this detailed record. 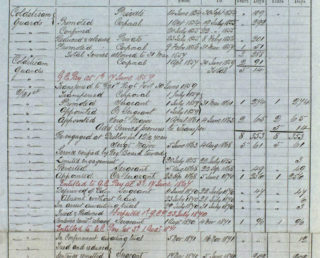 Summary record of Joseph Spick's army service: this image shows the central section of this detailed record sheet. 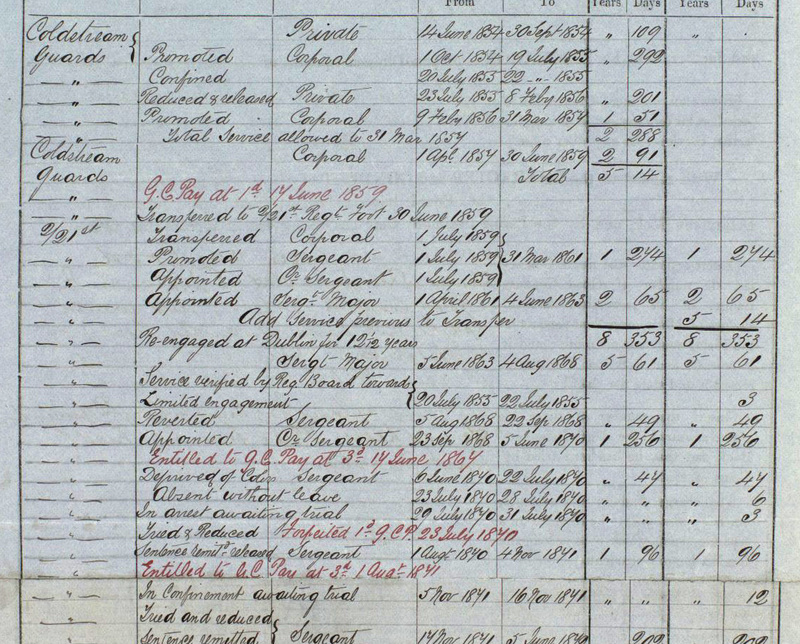 Summary record of Joseph Spick's army service: this image shows the lower section of this detailed record sheet. 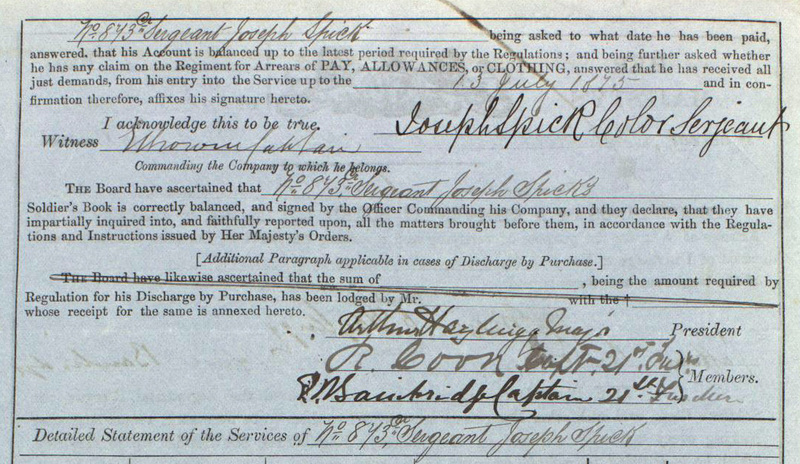 Declaration completed by Spick Joseph at his discharge from the army in 1875. Press report of Joseph Spick's bankruptcy, from the 1892 Nottingham Evening Post in 1892. Charles Spick with two of his workmen, at the yard in Grantham. An example of the advertisements placed in the Grantham Journal by Charles Spick. Charles Spick and his daughters, probably taken in Grantham in the post-WW1 years. The Silver War Badge issued to Percy Spick during WW1. Benjamin Spick, during the post-WW1 years in India. 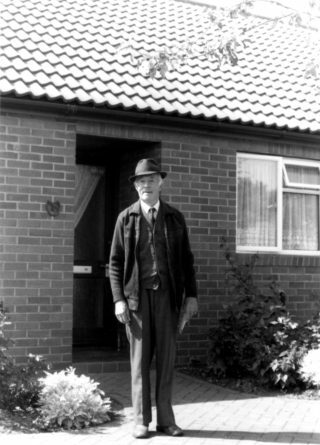 Robin Spick in 1981, from The Book of Bottesford by Michael Honeybone. Joseph Spick (1833-1900) 873 Colour-Sergeant (at one time Regimental Sergeant-Major) with the Coldstream Guards (Crimean War), 2/21st Battalion RNB Fusiliers and 1st Battalion Middlesex Militia – in total 21 years army service. Robert Spick (1879-1962) 2079 Lance-Corporal 4th Battalion Lincolnshire Regiment, c.8 years army service, first enlisted when 14 years 2 months old. Charles Spick (1881-1948) 2678 Private (Boer War) and Regimental Sergeant Major 4th Battalion, Lincolnshires – more than 10 years army service, first enlisted when 13 years 9 months old. Percy Spick (1884-1962) 6856 Corporal 1st Battalion Lincolnshire Regiment, 16 years army service. Benjamin Spick (1888-1948) 8095 Private 8095 2nd Battalion Leicestershire Regiment, c.12 years army service. This compilation of the World War 1 and earlier military service of members of the Spick family has been compiled from the family history told by Sue Spick of Muston. Sue is a daughter of Benjamin Spick (known as Robin, 1909-1993) and Marjorie Spick (nee Bryan) from Normanton. Additional information has been added from online genealogical searches. Robin Spick’s parents were Charles and Elitia (or Eletia) Spick, nee Price, of Grantham. Charles Spick was born in March, 1880, in Newark and died in June, 1948. Elitia Price, born in 1879, married Charles on the 29th May, 1899, at St Wulfram’s, Grantham, when they were both 19 years old. She died at the close of 1961, aged 82, and was buried in Bottesford on the 3rd January, 1962. Charles Spick was one of five sons of Joseph and Helen Spick. Joseph Spick was born in 1833 in Farndon, Newark, and died in Grantham in 1900. Helen Spick, nee Royle, was born in 1846 in Boston, Lincolnshire, and died in 1915. Their oldest son, George, was born in Lincoln in 1871. Then came Robert, Charles, Percy and Benjamin in this order. George was 42 in 1914 and thus too old to enlist in WW1, though this is not certain because very little information has been found regarding him. Charles Spick fought in the Boer War and then was an army trainer in Grantham where he lived during WW1. The other brothers, Robert, Percy and Ben, served in the army in WW1, Robert in the 4th Lincolnshires and Percy in the 1st Lincolnshires. Charles was also probably in the 4th Lincolnshires. Benjamin started with the 4th Lincolnshires but early on transferred to the 2nd Leicestershires. All survived the war. Charles was a well-known Grantham man with a successful scrap-metal business. Benjamin returned to India where he remained for the rest of his life. Robert and Percy both moved to Kent and stayed there for the rest of their lives. Joseph Spick served in the army from 1854 until 1875. He was 873 Colour Sergeant: Coldstream Guards, 2/21st R.N.B. Fusiliers, 1st Middlesex Militia. Joseph Spick was baptised on the 8th May, 1833, at Farndon, Nottinghamshire, son of John and Ann Spick. He became an infantryman and fought in the Crimean War and then served in the East Indies. He married and started his family while still a serving soldier. When discharged from the army in 1875, he had completed 21 years 7 days service. His record indicates that he fought in the Crimea for nine months, and then in the East Indies for 6 years and 7 months. It adds that he had no school certificate. His conduct was described as good, yet “his name appears four times in the Reg. Defaulters Book” and “he has been three times tried by court martial”. He first enlisted as 873 Private Spick with the Coldstream Guards at Lincoln on the 14th June, 1854, a labourer from Farndon aged 21. He was with the Guards until the 30th June, 1859, a period of 5 years 14 days. During this time he was promoted to Corporal, but was locked up for two days and reduced to Private in July 1855 (the nature of his offence is unclear) before being re-promoted to corporal in February 1856. He was transferred to the 2/21st R.N.B. Fusiliers on the 30th June 1859, then achieved rapid promotion to Sergeant, Colour-Sergeant and on the 1st April, 1861 to Sergeant Major, the rank he held when he was re-engaged at Dublin on the 5th June, 1863, for a further 12½ years. However, In August 1868 his rank reverted abruptly from Sergeant Major down to Sergeant (reason not stated) before he was re-promoted less than two months later to Colour Sergeant. 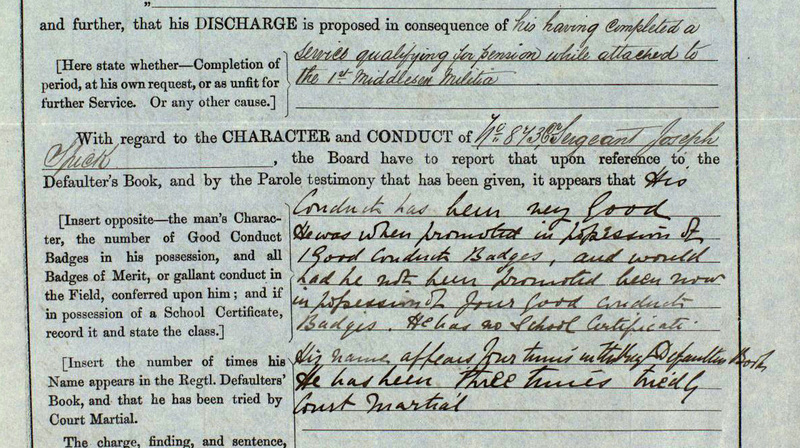 In 1870 he went “absent without leave”, resulting in court martial, a fine and being reduced again to Sergeant. 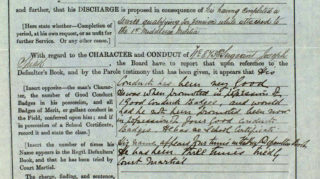 In 1871 he was tried again (details unclear), fined and reduced to Sergeant. 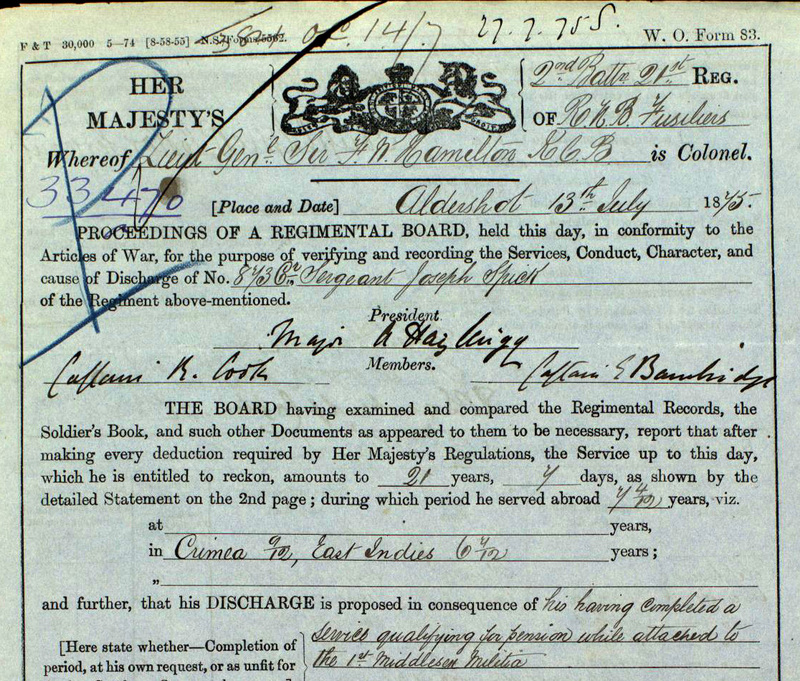 In June 1872 he was re-promoted to Colour Sergeant and was “detached for Duty with Permanent Staff”. Then in 1874 was transferred to the 1st Middlesex Militia, where he stayed until his release in 1875 with the rank of Colour Sergeant. He left the army at Aldershot on the 13th July 1875, aged 42 years and one month. In the census of 1861, he was recorded as a 28 years old married man, at Cheriton, near Elham, Kent, a Sergeant Major with 2/21 Reg’t. His wife (presumably his first wife) is not named in the census and no further information about her has been discovered. Also in 1861, the Naval and Military Gazette of the 2nd October reported that he had been awarded a silver watch and chain by his fellow officers and men of No.10 Company, 2nd Battalion, 21st R.N.B. Fusiliers at Dover to mark his promotion from Colour Sergeant to Battalion Sergeant Major. 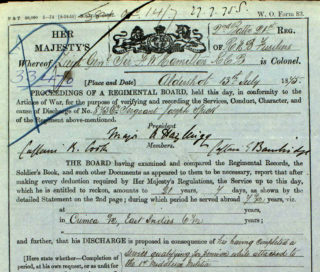 His name was recorded twice in the British Army Worldwide Index: in 1861 as 4450/873 Colour Sergeant Joseph Spick stationed at Shorncliffe and Dover (this is the only record of him having received a second service number, 4450); in 1871 he was recorded as 873 Sergeant Joseph Spick of the 2nd Bn 21st (Royal Scots Fusiliers) Regiment of Foot at regimental HQ at Thayetmyo, Burma. This was the year he was court martialled for the third time. He had been married during the preceding year and may have been upset at being separated from his wife and infant son, and moved to Burma. The Spick family tree (Ancestry, public family trees) provides the information that he in Grantham in 1870 he married Helen Royle (1846-1915), daughter of James Royle (a plumber and glazier, b.1812 at Wrangle, Lincs) and Helen Bailey Royle (b.1825 at Boston). The wedding appears likely to have taken place while he was “absent without leave”. After his final discharge in 1875, he brought his wife and their first son back to live in Newark. 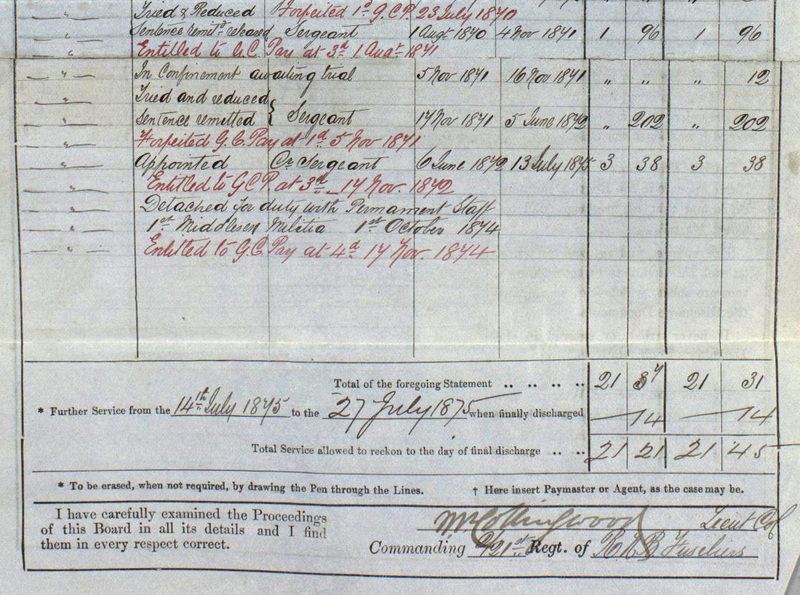 In the 1881 census, Joseph (now employed as a clerk) and Helen Spick lived at 5 Ridley’s Yard, North Gate, Newark, with their children George (aged 10), Robert (2) and Charles (in his first year). Then in 1891 Joseph (now a general labourer) and Helen lived at Middlemore Yard, Grantham, with sons Robert (aged 12), Charles (10), Percy (6) and Benjamin (5). 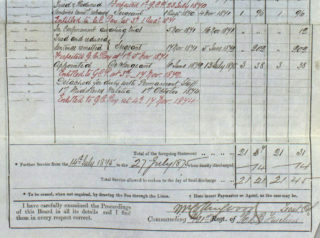 The 1891 census gives Helen’s birthplace as Kent, suggesting that her parents had been living in the southern county when she was born and that she may have met Joseph when he was based there. Joseph Spick died in 1900 in Grantham, aged 68. Helen died in 1915. Footnote – The R.N.B. Fusiliers: The Earl of Mar’s Regiment of Foot, first raised in 1678, went through a series of changes of name and became the 21st (Royal North British Fusiliers) Regiment of Foot in 1751, then the 21st (Royal Scots Fusiliers) Regiment of Foot in 1877. George Thomas Spick was the oldest of Joseph and Helen’s sons, born in 1871 in Lincoln, soon after his parents’ marriage and when his father was still a serving soldier. Little seems to be known about his life. Bethan Marsh’s family tree research (Ancestry, Public Family Tree) tells us that he moved to Nottinghamshire, and in 1899 was married to Getrude Mary Sharpe, who was born in 1871 at Friesthorpe, Lincolnshire. In 1911, they lived at Lincoln. No further information has been discovered. Robert Spick was born in 1879 in Lincoln, the second son of Joseph and Helen Spick. In 1881 he was with his parents in Newark, and in 1891 with them in Grantham. Though general known as Robert Spick, his full name was Robert Clement Dye Spick. ‘Dye’ was a family name, and was sometimes used as his surname, as in the 1939 register. In 1911, Robert Spick lived in Grantham at 15 Union Court, Inner Street, Grantham, with his wife Emily (nee Haynes) and their two year old son Robert A Spick jnr. At this time he was employed as a labourer at a corn merchant’s. Emily E Haynes, was born in 1883 in Fulham. They married in Grantham in the third quarter of 1914. Sadly, Emily Spick died in 1917 in Kensington. Robert Spick first attested and enlisted at Grantham on the 19th March 1894 as 2079 4th Lincolnshires, a boy soldier aged 14 years 2 months, only 4 feet 9 inches tall. His service lasted almost six years, until on the 29th January 1900, when he was reported as “absent from embodiment” and on the 20th February 1900 was “struck off by court of enquiry”. Where he went after this set back is not known, and no record of him has been found in the 1901 census. He enlisted again on the 28th August, 1914, aged 35, as 10847 Private Robert Spick, 6th Battalion Lincolnshire Regiment. His MIC states that his ‘entry into a theatre of war’ was on the 15th July 1915. He first served in the Balkans (Dardanelles). He attained the rank of Lance-Corporal. He was awarded Silver War Badge no.1090 on the 6th April 1916, wounded, under Kings Regulation 392(xvi). His MIC also has information that his Silver Badge was brought in by police on the 23rd August 1917, though where and the reason why the police were involved is not known. Robert Spick was awarded the 1914-15 Star, the British War Medal and the Victory Medal. From the post-war years there is a record in the 1939 register of a Robert C Dye (Spick), b.26/1/1879, living at 32 Blenheim Place, Penge, Kent, with his wife Mabel Dye (Spick), b.3/2/1888. There is also a record of a Robert C Dye, who passed away in 1962 in Bromley, Kent. Though not entirely certain, it is most probable that both these refer to the ex-serviceman originally from Grantham. Charles Spick, born in 1881, was the third son of Joseph and Helen Spick. In 1881, he was his parents and brothers in Newark, and in 1891 at the family home in Middlemore Yard, Grantham. He married Elitia Price on the 28th May 1899 at St Wulfram’s, Grantham. They were both 19 years old. His 1948 obituary says that the Prices were cousins of the Spicks, and the two families worked together on government contracts during the war (WW1). It is tempting to conclude that Elitia was one of the Newark family. She did indeed come from Newark. In 1901 she was one of nine young women boarding and employed as a waitress at the GNR Refreshment Rooms at Grantham Station. She was born in September 1879 at Newark, one of four children of Hiram and Marian Price. Then, in 1901, following his father’s death in 1900, 20 years old Charles had become head of the family at Middlemore Yard, with his wife Elitia, their baby daughter Violet, and his younger brother Percy, aged 18. The census states that Charles had become a ‘hawker’, a small trader whose business would prosper in the years to come. At the same time, he was also a serving soldier, presumably recently returned from the Boer War. In 1911, Charles, now a ‘general dealer’, and Elitia had moved to 11 New Street, Grantham, where there were now six children: Violet (aged 12), Rose (9), Dora (7), Charles (5), Ben (2) and baby Gladys. Charles Spick was in the army for some ten years, between 1894 and 1904. He first attested at Grantham on the 19th March, 1894, as a boy aged 13 years 9 months, 4 feet 9¾ inches tall. He was pronounced ‘fit’ to serve and became 2678 4th Battalion, Lincolnshires. His service record states that he, Private 2678 Charles Spick, was re-engaged on the 14th July 1895. Then there is an entry saying that he joined on re-embodiment on the 29th January 1900, and then was disembodied on the 17th October 1900. The last entry says that his time expired on the 18th March 1904. This brief record is confusing. 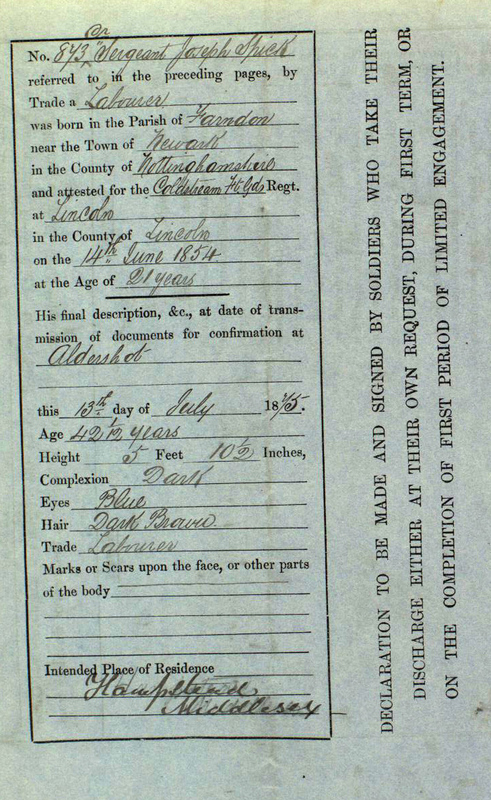 It appears to indicate that he became an under-age and probably part-time militia ‘man’ from 1894, and was a reservist called to re-join in 1900 as a full-time soldier, which he remained until 1904. Information in his obituary (1948) makes it clear that he served at least part of that time in the South Africa war. It also relates that he was at one time a “bugler to Queen Victoria”, which must relate to his early army service when he may well have been a boy bugler with the Lincolnshires. His obituary adds that during WW1 he was “engaged in training personnel at Grantham”, and that like his father he attained the rank of Regimental Sergeant Major: this is unlikely to be during his 1900-1904 service, in that he would have been young and inexperienced at that time, so it seems that he reached his highest rank during his WW1 service. It is therefore probable that he re-enlisted during the war but remained in the Grantham area. Charles Spick started a ‘rag and bone’ business in Grantham during the first decade of the 20th Century. This grew into a successful business. During WW1, Charles Spick successfully supplied large quantities of scrap metal to meet government requirements, and at the end of the war he was engaged in clearing the army camp at Belton Park. In time he was able to pass to the next generation, in particular his son Robin, who moved his business to Bottesford, living in the house on Easthorpe Lane on the corner of the lane which leads to the mill. In 1928, Charles and Elitia were registered voters living at 28 Union Street, Grantham. Charles and Elitia had eight children: Violet, Rose, Dora, Charles, Benjamin, Gladys, Joseph and Mary. Charles Spick died on the 2nd April, 1948, and Elitia on the 23rd December, 1961. They are buried together in Bottesford church yard. Percy Spick was born in October 1884 in Grantham, the fourth son of Joseph and Helen Spick, and in 1891 was living with the family in Middlemore Yard, Grantham. In 1901 he was 18 years old, living with his brother Charles and wife Eletia and daughter Violet. The address was in Middlemore Yard, Grantham, probably their parents’ house. Charles was a hawker and Percy was working as a baker’s labourer. Joseph, their father, had died in 1900. Their mother, Helen, was not recorded living in Middlemore Yard, and her whereabouts have not been discovered. Percy Spick joined the Lincolnshire Regiment aged 19. He enlisted on 23rd September 1903 and was discharged over fifteen years later on the 24th January, 1919, having been wounded. His Regimental Number was 6856. He served in France where his service commenced on the 26th January 1915. In 1915, a Corporal with the 1st Lincolns, he was admitted to hospital on the 15th March, but details of his injuries have not been found. Later, 6856 Percy Spick, now with the rank of Colour-Sergeant, was awarded Silver War Badge number B96300, being honourably discharged due to wounds (King’s Regulations (392 xvia). He was discharged from the army on the 24th January 1919. His MIC records that he was awarded the 1914-1915 Star, the Victory Medal and the British War Medal. Percy Spick was married in October 1912 to Alice Selina Jones in Fulham, London. In 1939, Percy and Alice lived at 85 Biggin Hill, Croydon, with daughters Constance and Daphne plus two other children (whose records are not available). He died in Croydon on the 22nd October, 1962, aged 68. Benjamin Spick was born in 1888 in Grantham, the fifth and youngest son of Joseph and Helen Spick. In 1891 the family lived in Middlemore Yard that seems to have been near Elmer Street South, Grantham. Joseph Spick was a general labourer. 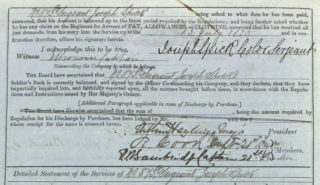 Benjamin Spick attested at Grantham on the 18th December 1906, nineteen years old, a single man employed as a ‘carman’. He became Private 4567 of the 4th Lincolnshires, but was transferred to the Leicestershire Regiment on the 5th February, 1907. In 1911, he was recorded in the census at Fort St. George, Madras. He was still single, 23 years old, Private 8095 of the 2nd Battalion Leicestershire Regiment. On the 29th July, 1914, he married Alice Maude Carmichael at South Black Town, Emmanuel, Madras. He was 26, she was 30, daughter of Henry Russell Carmichael. They went on to have four daughters, Brida, Violet, Daisy and Dorothy (Bethan and Chris Marsh family tree, Ancestry). According to the information on his MIC his Service Number was 8095 and he disembarked on the 12th October, 1914. Soon after the start of WW1 the 2nd Leicesters were recalled from India to join the British army on the Western Front. Benjamin Spick was awarded the 1914 Star as a member of the BEF. He was also awarded the Victory Medal and the British War Medal when he had become a Lance-Corporal. A photograph taken after the war shows that he had lost his right leg, and it seems likely that this was the result of his war injuries. After the end of WW1 Benjamin returned to India where he became a bank manager. Benjamin Dye Spick died on the 27th May, 1948, of heart failure at the Civil Orphans Asylum, Madras. He was buried the following day, the funeral lead by the Chaplain, Rev. E.J.M. Wyld. The funeral record adds that he had been the Gate-Sergeant, Imperial Bank of India. This happened barely a month after his brother Charles had passed away. Robin Spick was one of the sons of Charles Spick, and it was he that continued the scrap metal business. The list of mourners at Charles Spick’s funeral included three sons, Charles, Robin and Joseph, but ‘Robin’ was in fact Benjamin (Robin was a family nickname), the second of the three sons of Charles. The scrap metal yard was moved to premises on Rutland Lane, Bottesford, at the junction with Easthorpe Lane. The site has since been built over with new houses. Apparently, the old yard on Union Street was on land that was eventually redeveloped for the Asda Supermarket. 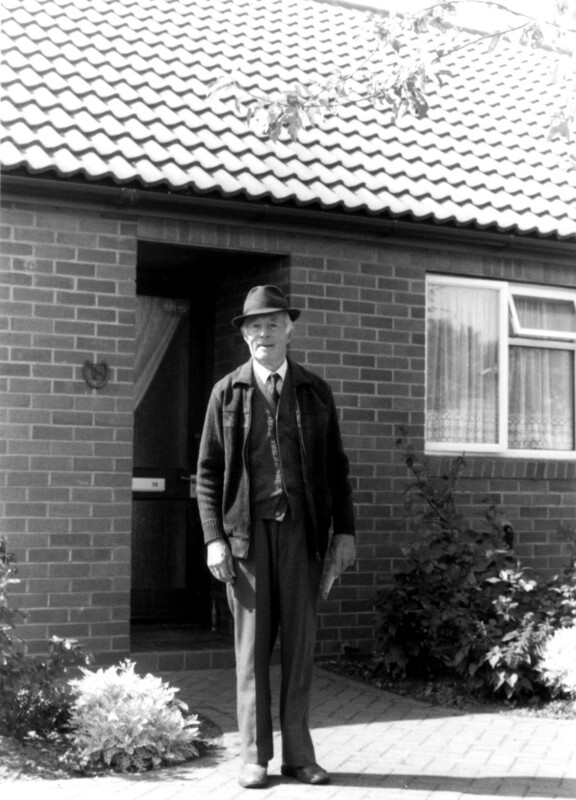 Robin came to live in the house on the corner of Easthorpe Lane and Mill Lane, where the photograph of him in Michael Honeybone’s Book of Bottesford was probably taken.